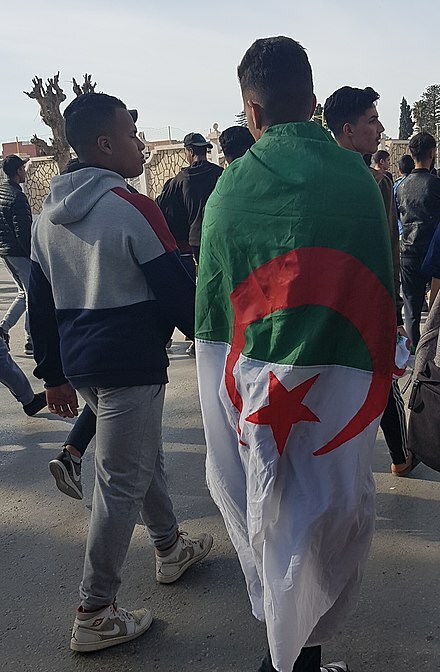 The 2019 Algerian protests, also called the Smile Revolution,   began on 16 February 2019, ten days after Abdelaziz Bouteflika announced his candidacy for a fifth presidential term in a signed statement. Abdelaziz Bouteflika is an Algerian politician who served as President of Algeria from 1999 until 2019. 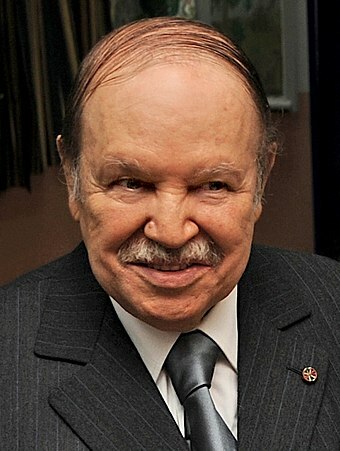 Abdelaziz Bouteflika has been president of the People's Democratic Republic of Algeria since 1999. Two amnesties (via referendum) for former combatants in the Algerian Civil War had taken place during his presidency (1999 and 2005). This "dirty war" between Islamic guerrillas and the government had claimed up to 200,000 lives from 1991–2002. Nearly half of the Algerian population was born after the end of the conflict, amidst the din of repeated corruption scandals. Tlemcen is a city in north-western Algeria and the capital of the province of the same name. The city has developed leather, carpet and textile industries, which it ships to the port of Rashgun for export. It had a population of 140,158 at the 2008 census, while the province had 949,135 inhabitants. The Algerian Constitution of 2016 is the fundamental law of Algeria. The proposed constitution was presented on 4 February 2016 by prime minister Abdelmalek Sellal. and then adopted on 7 February 2016. The 2016 Constitution replaces the 1996 Constitution. Inquiries were announced into "corruption and illicit overseas capital transfers" on 1 April 2019. Ali Haddad was arrested trying to cross the border into Tunisia after liquidating stock worth €38m. On the same day, Bouteflika promised to step down by the end of his term on 28 April. The Sétif and Guelma massacre was a series of terrorist attacks by French colonial authorities and Pied-noir settler terrorist militias on Algerian civilians in 1945 around the French Algerian market town of Sétif, west of Constantine, Algeria. French police fired on demonstrators at a protest on 8 May 1945. Riots in the town were followed by attacks on French colons (settlers) in the surrounding countryside, resulting in 102 deaths. Subsequent attacks by the French Colonial authorities and European settler terrorists caused deaths among the Muslim population of the region; estimates ranged between 1,020 and 45,000 people killed. Both the outbreak and the indiscriminate nature of its repression are thought to have marked a turning point in Franco-Algerian relations, leading to the Algerian War of 1954–1962. Abdelhak Layada, also known as Abu Adlane, was one of the founders of Algeria's militant Islamist group Armed Islamic Group (GIA) during the Algerian Civil War, and led it after the death of Mohamed Allel. The working conditions of journalists in Algeria have evolved since the 1962 independence. After 1990, the Code of Press was suppressed, allowing for greater freedom of press. However, with the civil war in the 1990s, more than 70 journalists were assassinated by Islamists. Sixty journalists were killed between 1993 and 1998 in Algeria. Elements of both sides in the Algerian War of Independence—the French Armed Forces and the opposing Algerian National Liberation Front (FLN)—used deliberate torture during that conflict (1954–1962), creating an ongoing public controversy. Pierre Vidal-Naquet, a French historian, confessed that there were "hundreds of thousands of instances of torture" by the French military in Algeria. The FLN engaged in the use of torture against pro-French and uncommitted members of the Algerian population in retaliation for the French's use of torture. The Oujda group or Oujda clan was a gathering of military officers and politicians in Algeria, during its War of Independence (1954-62) and until approximately the 1970s. Rachad is an Algerian political movement. Its stated objective is to break with political practices in place since independence and ensure, through "non-violent means", that the Algieran state complies with "the rule of law", democratic legitimacy and participation and "good governance". It calls upon the Algerian people to overthrow the government by peaceful mass protests, arguing that the government is controlled by a military junta largely responsible for the horrors of the Algerian Civil War and for the country's economic and social malaise. The movement has the reputation for having a high "intellectual calibre of the leadership" and for transcending the gulf between secular and Islamist politics. Mourad Medelci was an Algerian politician who served in the government of Algeria as Minister of Foreign Affairs from 2007 to 2013. He was President of the Constitutional Council of Algeria from 2013 until his death in 2019. Presidential elections were held in Algeria on 9 April 2009. The result was a victory for incumbent President Abdelaziz Bouteflika, who was re-elected with 90% of the vote. Events from the year 2007 in Algeria. 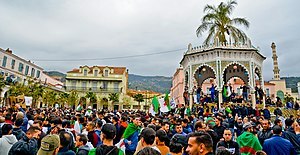 A legislative election was held in Algeria on 10 May 2012. The incumbent coalition, consisting of the FLN of President Abdelaziz Bouteflika and the RND of Prime Minister Ahmed Ouyahia, held on to power after winning a majority of seats. The Islamist parties of the Green Algeria Alliance lost seats. Presidential elections were held in Algeria on 17 April 2014. Incumbent President Abdelaziz Bouteflika was re-elected with 82% of the vote. Issues in the campaign included a desire for domestic stability after the bloody civil war of the 1990s, the state of the economy, the frail health of the 15 year incumbent and 77-year-old president whose speech was "slurred and inaudible" in his only public outing during the campaign, and the less-than-wholehearted support given the president by normally united and discrete ruling class. Algeria–Mexico relations refers to the diplomatic relations between Algeria and Mexico. Djelloul Khatib alias commandant Djelloul was a combatant for the Algerian independence and a public servant. During the war of independence he led the efforts towards the professionalization of the National Liberation Army (NLA). He contributed thereafter to building the civil service of newly independent Algeria. Ouled EL Bahdja, is a campaign among fans of USM Alger to restore the matchday atmosphere within Virage specifically, and Omar Hamadi Stadium more generally. It was established by a group of Algiers fans from Casbah in the nineties. Presidential elections are scheduled to be held in Algeria on 4 July 2019. They were originally scheduled to take place on 18 April, but President Abdelaziz Bouteflika postponed the election in response to protests against his candidacy for a fifth term. Bouteflika resigned on 2 April and Abdelkader Bensalah took office as acting president the following week. On 10 April it was announced that the election had been re-scheduled for 4 July. Bensalah is not eligible to participate. 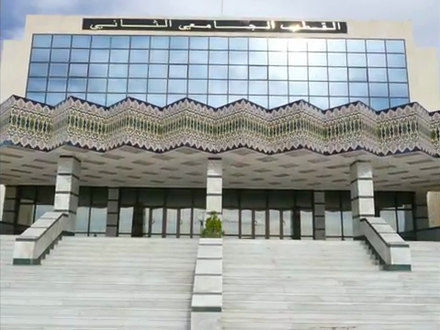 The Algerian Academy of Amazigh Language is the pre-eminent Algerian council for matters pertaining to the Amazigh language. 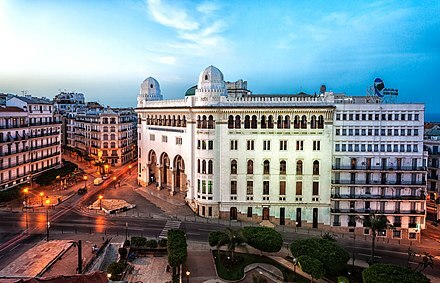 The Academy was officially established in 27 December 2017 by Abdelaziz Bouteflika. The 2018–19 Algerian Ligue Professionnelle 1 will be the 55th season of the Algerian Ligue Professionnelle 1 since its establishment in 1962. A total of 16 teams will contest the league. ↑ "Blessé vendredi dernier, un jeune manifestant est mort aujourd'hui — TSA" [Wounded last Friday, a young protestor died today - TSA]. TSA (in French). 19 April 2019. Retrieved 19 April 2019. ↑ "Algérie: un manifestant blessé meurt" [Algeria: A wounded protester dies]. Le Figaro (in French). 19 April 2019. Retrieved 19 April 2019. 1 2 "Größte Proteste gegen Bouteflika: 200 Verletzte und 200 Festnahmen in Algerien" [Biggest protests against Bouteflika: 200 injured and 200 arrests in Algeria]. ZDF (in German). 9 March 2019. Retrieved 9 March 2019. 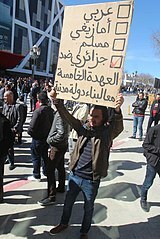 ↑ "Proteste weiten sich aus: Hunderte Festnahmen in Algerien" [Protests are spreading: hundreds of arrests in Algeria]. n-tv (in German). 8 March 2019. Retrieved 9 March 2019. ↑ Adlène Meddi (15 March 2019). "Algérie, les 4 pièges à éviter pour la "révolution du sourire"" [Algeria, the 4 traps to avoid for the "smile revolution"]. Le Point (in French). Retrieved 16 March 2019. ↑ Myriam Belkaïd (19 March 2019). "La révolution du sourire, Acte 1, scène 4" [The Smile Revolution, Act 1, Scene 4]. HuffPost Maghreb (in French). Retrieved 2 April 2009. ↑ Ahmed Rouaba (1 March 2019). "Algeria protests: The beginning of the end?". BBC News . Retrieved 9 March 2019. 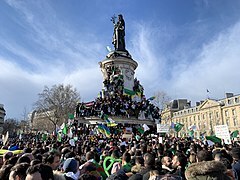 ↑ "Algeria: Thousands protest against fifth term for president". DW News . 1 March 2019. Retrieved 9 March 2019. 1 2 3 Mehdi Alloui (2 April 2019). "Le président Bouteflika démissionne" [President Bouteflika resigns]. HuffPost Maghreb (in French). Retrieved 2 April 2009. ↑ Pascal Jalabert. "Bouteflika écoute le peuple et renonce" [Bouteflika listens to the people and gives up]. Le Progrès (in French). pp. 2–3. Sa première prioité, rétablir la paix, alors que l'Algérie est plongée dans la guerre civile depuis 1992 contre le guérilla islamiste (quelque 200 000 morts en dix ans). 1 2 Tlemçani, Rachid (2008). "Algeria Under Bouteflika: Civil Strife and National Reconciliation" (PDF). Carnegie Papers. 7. ↑ Farid Alilat (17 July 2015). "Algérie: Tlemcen Power, une ville au coeur du pouvoir" [Algeria: Tlemcen Power, a city in the heart of power]. Jeune Afrique (in French). Retrieved 6 April 2019. Quant aux entrepreneurs locaux qui ont bénéficié de projets en tant que sous-traitants des Chinois, ils attendent toujours d’être payés. ↑ Youcef Bouandel (6 March 2019). "Algerians have learned the lessons of the Arab Spring". Al Jazeera. Retrieved 11 March 2019. ↑ "L'Algérie réforme sa Constitution et limite à deux le nombre de mandats présidentiels" [Algeria reforms its constitution and limits to two the number of presidential terms]. France 24 (in French). 7 February 2016. Retrieved 9 March 2019. ↑ Yassin Ciyow (27 February 2019). "Abdelaziz Bouteflika, l'absent omniprésent en Algérie" [Abdelaziz Bouteflika, the omnipresent absentee in Algeria]. Le Monde (in French). Retrieved 9 March 2019. 1 2 3 4 Adlène Meddi (24 February 2019). "Manifestations du 22 février: pourquoi les Algériens sont en colère" [22 February protests: why Algerians are angry]. Le Point Afrique (in French). Retrieved 9 March 2019. ↑ "Scandal envelops Sonatrach". Meed. 27 January 2010. Retrieved 7 April 2019. ↑ "Algérie: scandale à la Sonatrach" [Algeria: scandal at the Sonatrach]. BBC (in French). 21 February 2013. Retrieved 7 April 2019. ↑ "Le clan Bouteflika et les oligarques ont exacerbé la corruption" [The Bouteflika clan and the oligarchs exacerbated the corruption]. El Watan (in French). 8 April 2019. Retrieved 8 April 2019. ↑ Adlène Meddi (29 June 2018). "Algeria suffers a long hot summer of political scandal – again". Middle East Eye. ↑ "Algeria's Cocainegate Continues to Uncover Corrupt Officials". The North Africa Post. 15 September 2018. Retrieved 21 April 2019. ↑ Ali Ezhar (3 April 2019). "La Grande Mosquée d'Alger, le chantier de trop du président déchu Abdelaziz Bouteflika". Le Monde (in French). Retrieved 5 April 2019. Elle symbolise [...] tous les ratés du « système » algérien, la « gestion calamiteuse » de l’argent public par le chef de l’Etat, comme l’avait décrit la presse algérienne, mais aussi sa « mégalomanie » et ses « caprices ». ↑ "La folie des grandeurs du Président déchu". El Watan (in French). 8 April 2019. Retrieved 8 April 2019. 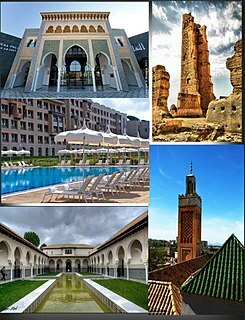 Soit 55 m de plus que celui de la mosquée Hassan II de Casablanca, la grande rivale marocaine. ↑ "Djamaa el Djazair – Algeria". Francesco Lovison, architetto (in Italian). Retrieved 7 April 2019. ↑ Amir Mohamed Aziz (26 March 2019). "Protesting Politics in Algeria". Middle East Research and Imformation Project (MERIP). Retrieved 15 April 2019. ↑ Yazid Alilat. 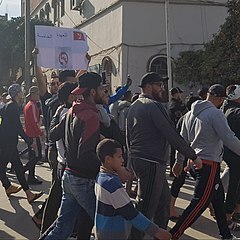 "A la suite d'un appel anonyme à une marche: Alger bouclée par la police" [Following an anonymous call to a march: Algiers cordoned off by the police]. www.lequotidien-oran.com (in French). Retrieved 9 March 2019. ↑ "Mystérieux appels à manifester à Alger: une journée ordinaire sous haute surveillance policière" [Mysterious calls to demonstrate in Algiers: an ordinary day under heavy police surveillance]. TSA (in French). 1 December 2018. Retrieved 9 March 2019. ↑ "Algérie: manifestations à Béjaïa contre la candidature de Bouteflika pour un cinquième mandat (vidéo)" [Algeria: protests in Béjaïa against Bouteflika's candidacy for a fifth term (video)]. France Maghreb (in French). 21 February 2019. Retrieved 9 March 2019. ↑ "Imposante manifestation contre le cinquième mandat à Kherrata" [Imposing demonstration against the fifth term in Kherrata]. Algérie Patriotique (in French). Retrieved 9 March 2019. ↑ "Algérie: retour sur une journée de mobilisation inédite contre la candidature de Bouteflika" [Algeria: return on a day of unprecedented mobilization against the candidacy of Bouteflika]. Le Point Afrique (in French). Retrieved 9 March 2019. ↑ "Algérie: la rue ne peut plus "encadrer" la candidature de Bouteflika à un 5e mandat" [Algeria: the street can no longer "frame" the candidacy of Bouteflika for a 5th term]. Franceinfo (in French). Retrieved 9 March 2019. ↑ "Un cheval offert au portrait de Bouteflika: naissance d'un culte rituel?" [A horse offered to the portrait of Bouteflika: birth of a ritual worship?]. Al HuffPost Maghreb (in French). 26 April 2018. Retrieved 9 March 2019. ↑ "Le FLN offre un cadre ... au cadre du président Bouteflika (Vidéo)" [FLN offers a framework ... to President Bouteflika's framework (Video)]. Al HuffPost Maghreb (in French). Retrieved 9 March 2019. ↑ Jérôme Duval; Jenny Bright (trans.) (8 March 2019). "The "Hirak" Movement in Algeria Against Bouteflika's "Mandate of Shame"". Counterpunch. Retrieved 15 March 2019. 1 2 Amir Akef; Charlotte Bozonnet; Madjid Zerrouky (23 February 2019). "Algérie:révolte inédite contre le pouvoir". Le Monde (in French). Retrieved 25 February 2019. ↑ "Une vague anti-5e mandat prend forme: Toute l'actualité sur" [An anti-5th term wave takes shape: All the news on]. liberte-algerie.com (in French). Retrieved 9 March 2018. 1 2 3 4 "Manifestations massive en Algérie contre un cinquième mandat de Bouteflika" [Massive protests in Algeria against Bouteflika's fifth term]. La Tribune (in French). 2 March 2019. Retrieved 9 March 2019. ↑ "Algérie: manifestations émaillées de heurts contre un 5e mandat de Bouteflika" [Algeria: Enamelled demonstrations of clashes against a 5th term of Bouteflika]. FranceSoir (in French). Retrieved 9 March 2019. ↑ "Algérie: "un million de personnes dans la rue et aucune image à la télévision"" [Algeria: "a million people on the street and no picture on television"]. Franceinfo (in French). Retrieved 9 March 2019. Selon Akram Kharief, fondateur du site Menadefense, spécialisé dans la défense et le renseignement qui cite de sources policières, ils étaient entre 800 000 et un million dans la rue. 1 2 Olivier Bot (1 March 2019). "Les médias du monde parlent de Bouteflika et de Genève" [World media speak of Bouteflika and Geneva]. 24 heures (in French). Retrieved 9 March 2019. ↑ "Algérie: une nouvelle manifestation contre un 5e mandat du président Bouteflika, plusieurs arrestations" [Algeria: a new demonstration against a 5th term of President Bouteflika, several arrests]. BFMTV (in French). Retrieved 9 March 2019. ↑ "Dozen journalists arrested at Algiers censorship protest". TheEastAfrican . 28 February 2019 – via AFP. ↑ Hacen Ouali (7 March 2019). "Algérie: et le camp "Boutef" flippa" [Algeria: and camp "Boutef" flippa]. Libération (in French). Retrieved 7 April 2019. ↑ "Algérie. La télévision d'Etat diffuse des images des manifestations contre un 5e mandat" [Algeria. State television broadcasts footage of protests against a fifth term]. Ouest-France (in French). 2 March 2019. Retrieved 11 March 2019. ↑ "Le défunt Hassan Benkhedda inhumé au cimetière de Sidi Yahia à Alger" [The late Hassan Benkhedda buried at the cemetery of Sidi Yahia in Algiers] (in French). Retrieved 9 March 2019. ↑ "Hassan Benkhedda est mort lors de la marche de la dignité: la famille de l'ancien président du GPRA confirme" [Hassan Benkhedda died during the walk of dignity: the family of the former president of the GPRA confirms] (in French). 2 March 2019. Retrieved 14 March 2019. ↑ Shehab Kahn (3 March 2019). "Algeria protests: Son of former prime minister dies in anti-government demonstration". The Independent . Retrieved 17 March 2019. 1 2 "Algérie: Bouteflika limoge son directeur de campagne" [Algeria: Bouteflika sacks his campaign director]. Le Figaro (in French). 2 March 2019. Retrieved 9 March 2019. ↑ ""Le verdict a été donné par le peuple!"" ["The verdict was given by the people!"]. El Watan (in French). Retrieved 9 March 2019. ↑ "Algérie: l'option d'un report de la présidentielle a bien été évoquée – RFI" [Algeria: the option of a postponement of the presidential election has been raised – RFI]. RFI Afrique (in French). Retrieved 9 March 2019. ↑ "Bouteflika formellement candidat à la présidentielle du 18 avril" [Bouteflika formally presidential candidate of 18 April]. L'Orient-Le Jour (in French). Retrieved 9 March 2019. ↑ "Algérie: Abdelaziz Bouteflika dit comprendre "l'inquiétude" mais maintient sa candidature" [Algeria: Abdelaziz Bouteflika says he understands "worry" but maintains his candidacy]. Le Monde.fr (in French). Retrieved 9 March 2019. ↑ Adam Nossiter (3 March 2019). "Algeria Protests: President's Offer Fails to Temper Outrage". The New York Times . Retrieved 9 March 2019. ↑ "Présidentielle en Algérie: Benflis, principal adversaire de Bouteflika, renonce" [Presidential election in Algeria: Benflis, Bouteflika's main opponent, gives up]. L'Obs (in French). Retrieved 9 March 2019. ↑ "Bouteflika s'engage à céder le pouvoir s'il est élu président en avril" [Bouteflika commits to hand over power if elected president in April]. Le Figaro (in French). Retrieved 9 March 2019. ↑ "Algérie: Bouteflika brigue un cinquième mandat" [Algeria: Bouteflika seeks fifth term]. La Tribune (in French). Retrieved 9 March 2019. ↑ "Manifestations nocturnes en Algérie contre la candidature de Bouteflika" [Nocturnal demonstrations in Algeria against Bouteflika's candidacy]. Europe 1 (in French). Retrieved 9 March 2019. ↑ "A Alger, la colère de la jeunesse répond à la candidature de Bouteflika" [In Algiers, the anger of youth responds to Bouteflika's candidacy]. Le Monde.fr (in French). Retrieved 9 March 2019. ↑ "Algérie: les étudiants boycottent les cours pour dénoncer la candidature de Bouteflika" [Algeria: Students boycott courses to denounce Bouteflika's candidacy]. Le Figaro (in French). Retrieved 9 March 2019. ↑ Fayçal Métaoui (4 March 2019). "Les mobilisations anti-Bouteflika s'intensifient en Algérie" [Anti-Bouteflika mobilizations intensify in Algeria]. www.leparisien.fr (in French). Retrieved 9 March 2019. ↑ Amayas Zmirli (4 March 2019). "Annonces de Bouteflika: les Algériens plus que sceptiques" [Bouteflika's announcements: Algerians more than skeptical]. Le Point Afrique (in French). Retrieved 9 March 2019. ↑ "Béjaïa: Le maire FLN de Oued Amizour s'oppose à un 5e mandat de Bouteflika" [Bejaia: Mayor FLN of Oued Amizour opposes a 5th term of Bouteflika]. Al HuffPost Maghreb (in French). Retrieved 9 March 2019. ↑ "Le doyen des maires algériens dit "non au 5e mandat" et démissionne" [Algerian mayor says "no to 5th term" and resigns]. Al HuffPost Maghreb (in French). Retrieved 9 March 2019. ↑ "Algérie: plusieurs milliers d'étudiants manifestent à Alger contre la candidature à un 5e mandat de Bouteflika" [Algeria: Several thousand students protest in Algiers against Bouteflika's fifth term]. LCI (in French). Retrieved 9 March 2019. ↑ "Contestation en Algérie: les étudiants maintiennent la pression" [Challenging Algeria: Students keep up the pressure]. Le Point Afrique (in French). Retrieved 9 March 2019. ↑ Le Point, magazine. "Algérie: nouvelles manifestations et mise en garde de l'armée" [Algeria: new demonstrations and warnings of the army]. Le Point (in French). Retrieved 9 March 2019. ↑ "Algérie: un millier d'avocats contre Bouteflika" [Algeria: a thousand lawyers against Bouteflika]. Le Figaro (in French). Retrieved 9 March 2019. 1 2 Yves Bourdillon (11 March 2019). "Algérie: Bouteflika rentre dans une capitale en pleine ébullition" [Algeria: Bouteflika returns to a capital city boiling]. Les Échos (in French). Retrieved 16 March 2019. ↑ "Les "18 commandements" du manifestant en Algérie" [The "18 Commandments" of the protester in Algeria]. Nouvel Obs (in French). 8 March 2019. Retrieved 16 March 2019. ↑ "Les vacances universitaires avancées pour tenter d'affaiblir la contestation" [Advanced university holidays to try to weaken the challenge]. tsa-algerie.com (in French). 9 March 2019. Retrieved 9 March 2019. ↑ "Algérie: l'armée déclare partager la même vision que le peuple" [Algeria: the army declares to share the same vision as the people]. RFI (in French). 11 March 2019. Retrieved 12 March 2019. ↑ Ruth Michaelson (11 March 2019). "Algerian president says he will not run again after weeks of protests". The Guardian. Retrieved 15 March 2019. ↑ "Algérie: les étudiants mobilisés dans la rue contre la "ruse" de Bouteflika" [Algeria: students mobilized in the street against the "ruse" of Bouteflika]. La Croix (in French). 12 January 2019. Retrieved 13 March 2019– via AFP. le véritable révélateur sera vendredi, premier jour de week-end et traditionnelle journée de manifestation depuis bientôt trois semaines. ↑ Madjid Zerrouky (15 March 2019). "En Algérie, l'opposition rejette le processus de "transition" du régime" [In Algeria, the opposition rejects the regime's "transition" process]. Le Monde (in French). Retrieved 19 March 2019. Pour le régime, il y a urgence. Après les étudiants et les enseignants, mardi et mercredi, les professions médicales, les avocats et les magistrats manifestaient jeudi dans plusieurs villes pour exiger le « départ immédiat » d’Abdelaziz Bouteflika. ↑ "Algerians keep up pressure on Bouteflika with more mass protests". France 24 . 15 March 2019. Retrieved 15 March 2019. 1 2 "Marée humaine en Algérie pour le quatrième vendredi de manifestation contre le pouvoir" [Human tide in Algeria for the fourth Friday of protest against power]. Le Monde (in French). 15 March 2019. Retrieved 15 March 2019– via AFP. ↑ Jason Burke; Ruth Michaelson (15 March 2019). "Algeria protests grow as elite distances itself from ailing president". The Guardian. Retrieved 16 March 2019. ↑ Amine Kadi (15 March 2019). "Algérie, la transition dirigée par Bouteflika cale d'entrée" [Algeria, the transition directed by Bouteflika stalls before it starts]. La Croix (in French). Retrieved 16 March 2019. ↑ News Agencies (17 March 2019). "Algerian PM has started talks to form new government". Al Jazeera . Retrieved 17 March 2019. 1 2 Lamine Chikhi; Hamid Ould Ahmed (19 March 2019). "Thousands rally in Algiers as protest leaders tell army to stay away". Reuters . Retrieved 19 March 2019. ↑ Adam Nossiter (26 March 2019). "Algeria Army Chief Opens Path to End of Bouteflika's Rule". New York Times. Retrieved 28 March 2019. ↑ "Algérie: un nouvel allié lâche le président Bouteflika" [Algeria: a new loose ally President Bouteflika]. Le Figaro (in French). Retrieved 1 April 2019. ↑ "Le PT démissionne de l'APN" [PT resigns from the NPC]. HuffPost Maghreb (in French). 27 March 2019. Retrieved 1 April 2019. ↑ William Maclean, ed. (29 March 2019). "Algeria authorities deny Algiers protest drew one million demonstrators". Reuters. Retrieved 31 March 2019. ↑ "Bouteflika "nomme un nouveau gouvernement"" [Bouteflika "appoints a new government"]. HuffPost Maghreb (in French). 31 March 2019. Retrieved 2 April 2019. ↑ "Des patrons claquent la porte du FCE" [Bosses slam the door of the FCE]. HuffPost Mahgreb (in French). 2 March 2019. Retrieved 6 April 2019. 1 2 "Déclenchement de l'opération "mains propres" contre les oligarques" [Triggering of the "clean hands" operation against the oligarchs]. HuffPostMaghreb (in French). 1 April 2019. Retrieved 1 April 2019. 1 2 Adam Nossiter (2 April 2019). "Algerian Leader Bouteflika Resigns Under Pressure From Army". New York Times. Retrieved 3 April 2019. ↑ "Algeria's next in line: Bouteflika loyalist Abdelkader Bensalah". France 24. 2 April 2019. Retrieved 2 April 2019. 1 2 3 "Algerian Constitutional Council declares presidency vacant". TASS. 3 April 2019. Retrieved 4 April 2019. 1 2 James McDougall (6 April 2019). "How Algeria's army sacrificed a president to keep power". BBC . Retrieved 14 April 2019. ↑ Aomar Ouali; Nadine Achoui-Lesage (9 April 2019). "Algeria's interim leader pledges to hold 'honest' election". Washington Post . Retrieved 10 April 2019. ↑ Zahra Chanoui (6 April 2019). "En Algérie, sans Bouteflika, les manifestants réclament le départ de ceux "qui ont mangé le pays"" [In Algeria, without Bouteflika, protesters demand the departure of those "who ate the country"]. Le Monde . Retrieved 6 April 2019. ↑ "Marche des étudiants à Alger: La police charge les manifestants à coups de gaz lacrymogènes et de jets d'eau" [Student march in Algiers: Police charge protesters with tear gas and water jets]. El Watan (in French). 10 April 2019. Retrieved 10 April 2019. ↑ "Algeria transition: Constitutional council head Belaiz resigns". Al Jazeera. 16 April 2019. Retrieved 17 April 2019. ↑ "Conseil constitutionnel: Tayeb Belaiz démissionne" [Constitutional Council: Tayeb Belaiz resigns]. El Watan (in French). 16 April 2019. Retrieved 17 April 2019. ↑ Nacima Ourahmoune (13 March 2019). "Algeria: how millennials used humour and creativity to force Abdelalziz Bouteflika to stand aside" . Retrieved 15 March 2019. ↑ Aili Mari Tripp (8 March 2019). "Women are deeply involved in the Algerian protests — on International Women's Day, and all the time". Washington Post. Retrieved 15 March 2019. ↑ Amine Kadi (7 March 2019). "Les Algériennes descendent en masse manifester" [Algerian women go down in protest]. La Croix (in French). Retrieved 16 March 2019. ↑ "Algeria protests: Youth lead the movement for change". 14 April 2014. Retrieved 15 April 2015. 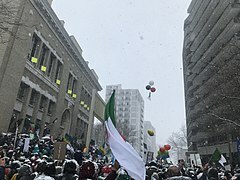 ↑ "Lyon: une manifestation contre un 5e mandat de Bouteflika en Algérie" [Lyon: a protest against a 5th term of Bouteflika in Algeria]. Le Parisien (in French). 2 March 2019. Retrieved 9 March 2019. ↑ "Plusieurs rassemblements auront lieu à partir de vendredi: La diaspora algérienne s'organise contre le 5e mandat" [Several rallies will be held from Friday: The Algerian diaspora is organizing against the 5th term]. El Watan (in French). 20 February 2019. Retrieved 9 March 2019. ↑ Massinissa Benlakehal; Sudarsan Raghavan (5 April 2019). "Their president is gone, but Algerians keep protesting and calling for democracy". Washington Post . A circle of Bouteflika allies — the influential lawmakers, relatives and business executives known as the “pouvoir,” or power — remains in control of the levers of the nation. They have become the protesters’ new targets. ↑ Kimberly White (17 December 2013). "Le Mystère des origines de Bouteflika" [The mystery of the origins of Bouteflika]. Slate Afrique (in French). Retrieved 11 March 2018– via Reuters. ↑ "Algérie: "Non, c'est non!" Des étudiants se rassemblent à nouveau dans le centre d'Alger" [Algeria: "No, it's no!" Students gather again in the center of Algiers]. L'Obs (in French). Retrieved 9 March 2019. ↑ Amale Ajebli. "Libérer l'Algérie, la chanson contre un cinquième mandat de Bouteflika fait un tabac" [Free Algeria, the song against a fifth term of Bouteflika is a hit]. Le Figaro (in French). Retrieved 9 March 2019. ↑ "Plus de 4 millions de vues" [More than 4 million views]. El Watan (in French). 12 March 2019. Retrieved 20 March 2019. ↑ Hamrouche, Ghada (15 March 2019). ""La Liberté" de Soolking repris en cœur à Alger" [Soolking's "Liberty" taken up again in Algiers]. Al HuffPost Maghreb (in French). Retrieved 20 March 2019. ↑ Mohamed Berkani. "Algérie: le cachir, ce saucisson devenu symbole de la révolte des opposants au 5e mandat de Bouteflika" [Algeria: the cachir, this sausage become symbol of the revolt of the opponents of the 5th term of Bouteflika]. Franceinfo (in French). Retrieved 9 March 2019. ↑ "Comedy and Dissent in the Algerian Popular Protests". jadaliyya.com. 2019. Retrieved 14 April 2019. ↑ "Welcome to the new Algerian revolution: an interview with Hamza Hamouchene". 17 April 2019. Retrieved 17 April 2019. ↑ Makhlouf Mehenni (2 March 2019). "La mort symbolique du fils de Benkhedda — TSA" [The symbolic death of Benkhedda's son — TSA]. TSA (in French). Retrieved 9 March 2019. ↑ Le Point, magazine. "Algérie: 41 arrestations lors des manifestations vendredi (police)" [Algeria: 41 arrests during protests Friday (police)]. Le Point (in French). Retrieved 9 March 2019. ↑ "Marche du 1er March: un décès, 63 blessés et 45 arrestations à Alger (officiel)" [March 1st march: one death, 63 wounded and 45 arrests in Algiers (official)]. Al HuffPost Maghreb (in French). Retrieved 9 March 2019. 1 2 3 "Manifestations en Algérie: la radio nationale muette, une cadre démissionne" [Protests in Algeria: the national radio mute, an executive resigns]. L'Orient-Le Jour (in French). 23 February 2019. Retrieved 9 March 2019. ↑ "Algérie: Campagne de boycott à l'encontre de plusieurs médias" [Algeria: Boycott campaign against several media]. Observ'Algérie (in French). Retrieved 9 March 2019. 1 2 "Algérie: La télévision d'État évoque enfin les manifestations, tout en les censurant" [Algeria: State television finally evokes the demonstrations, while censoring them]. L'Orient-Le Jour (in French). 2 March 2019. Retrieved 9 March 2019. ↑ "Algérie: "un million de personnes dans la rue et aucune image à la télévision"" [Algeria: "a million people on the street and no picture on television"]. Franceinfo (in French). Retrieved 9 March 2019. ↑ Listening Post (8 March 2019). 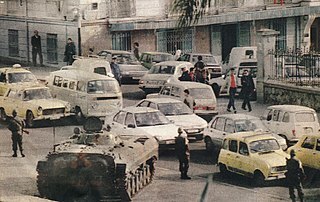 "The media battle of Algiers". Al Jazeera. Retrieved 16 March 2019. ↑ "Algérie: une présentatrice quitte le JT après avoir dû lire la lettre de Bouteflika" [Algeria: Presenter leaves the news after reading Bouteflika's letter]. Le Figaro (in French). Retrieved 9 March 2019. ↑ Sidali Amzal. "Echourouk et El Bilad privés de publicité" [Echourouk and El Bilad deprived of advertising]. Algerie Eco (in French). Retrieved 11 March 2019. ↑ "Algerian president Adelaziz Bouteflika drops bid for fifth term". BBC . 11 March 2019. Retrieved 12 March 2019. ↑ "Algerian businessman with ties to President Bouteflika arrested". Al Jazeera . 31 March 2019. Retrieved 1 April 2019. ↑ "Abdelkader Bensalah, un fidèle de Bouteflika qui va assurer l'intérim en Algérie" [Abdelkader Bensalah, a faithful Bouteflika who will ensure the interim in Algeria]. Le Monde (in French). 4 April 2019. Retrieved 4 April 2019. ↑ Omar Benderra (28 February 2019). 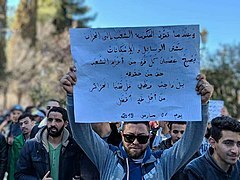 "Omar Benderra: quelques clés pour comprendre les manifestations du 22 février 2019 en Algérie" [Omar Benderra: some keys to understand the demonstrations of 22 February 2019 in Algeria]. Investig'action (in French). Retrieved 10 March 2019. Algerian opinion has long been beyond exasperation and it is only through the traditions of patience and rejection of violence that society has held itself together [...]. What the people contest and reject is not limited to extending the mandate of a president-zombie. ↑ Alexandre Devecchio; Boulem Sansal (28 February 2019). "Boualem Sansal: "Les jeunes exècrent le régime mais l'Algérie a peur d'une autre guerre civile"" [Boualem Sansal: "Young people execrate the regime but Algeria is afraid of another civil war"]. Le Figaro (in French). Retrieved 9 March 2019. ↑ "Algeria in revolt: "We woke up and you will pay"". openDemocracy. 12 April 2019. Retrieved 14 April 2019. ↑ Nabeel, Fahad (10 April 2019). "Geopolitics of post-Bouteflika Algeria". Centre of Strategic and Contemporary Research. Retrieved 14 April 2019. ↑ "The emerging front-runners in Algeria's uncertain election". Al-Monitor. 6 April 2019. Retrieved 17 April 2019. ↑ Al-Sholi, Ahmad (21 April 2019). "The End of Absurdity in Algeria". Jacobin. Retrieved 21 April 2019. ↑ "Algérie: le camp Bouteflika perd certains de ses soutiens – RFI" [Algeria: Bouteflika camp loses some of its support – RFI]. RFI Afrique (in French). Retrieved 9 March 2019. collusion entre et des parties influentes au sein du pouvoir et des hommes d’affaires véreux qui ont bénéficié de manière illicite de l’argent public. 1 2 "Washington & EU Support Algerian People's Right to Protest". The North Africa Post. 6 March 2019. Retrieved 9 March 2019. ↑ "Algérie: l'UE appelle au respect de la liberté d'expression" [Algeria: EU calls for respect for freedom of expression]. Le Figaro (in French). 5 March 2019. Retrieved 9 March 2019. ↑ "Les Etats-Unis "soutiennent le peuple algérien et son droit à manifester pacifiquement"" [The United States "supports the Algerian people and their right to demonstrate peacefully"]. HuffPost (in French). 6 March 2019. Retrieved 9 March 2019. ↑ "Emmanuel Macron appelle à "une transition d'une durée raisonnable" en Algérie" [Emmanuel Macron calls for "a transition of a reasonable duration" in Algeria]. France 24 (in French). 12 March 2019. Retrieved 16 March 2019. ↑ Salim Mesbah (19 March 2019). "Conférence de presse conjointe Lamamra et Lavrov: "C'est au peuple algérien de décider de son destin"" [Joint press conference Lamamra and Lavrov: "It's up to the Algerian people to decide their destiny"]. HuffPost Maghreb (in French). Retrieved 4 April 2019. Moscou refuse toute ingérence dans les affaires internes de l’Algérie [...] C’est au peuple algérien de décider de son destin en s’appuyant sur sa constitution et les lois internationales.